I Got a Monster in the Mail! And not just any monster, a purple monster. And not just any purple monster, this monster represents the achievement of a Big Hairy Audacious Goal! I received BHAG (or Mr BHAGgy, as I like to call him) from Nicole Fende, the Numbers Whisperer, a friend and client of mine, for finishing the Big Project: What to Feed Your Raiding Party. 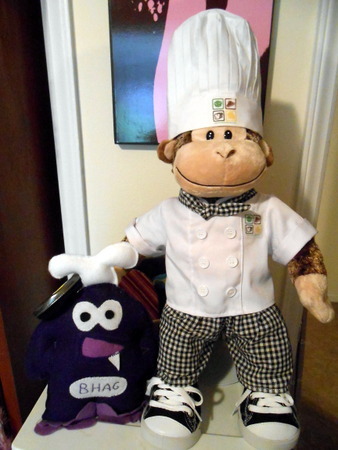 Nicole received him from Tea Silvestre, The Word Chef, who had him made and sent him out into the world to reward and encourage others to achieve their very own Big Hairy Audacious Goals. Now that Mr. BHAGgy has spent some time with us, I’ll be on the look-out for the next worthy recipient. Have you done something Big, Hairy AND Audacious lately? Let me know! Now, then, with Mr. BHAGgy and Chef George looking over my shoulder every night, it’s been a bit tough to go back to the pre-book status quo. And this past weekend I realized just why it felt like pulling teeth, trying to get that week’s comics put together: I’m not in love with the format anymore. I don’t have a problem with a weekly schedule–I blog 5 times a week. No, it’s not the schedule–at least not only the schedule–it’s how much time those strips tie up when things aren’t clicking. And how much time there just isn’t if I were to be faced with a killer opportunity or have a wild hair that needs straightening right that moment (metaphorically speaking, of course). So, effective immediately, Cocktail Hour as we knew it is done. I’ll still use it for odd one-shots here and there, but a weekly schedule is out the window. For now, Where the Geeks Are is going to stay the same, though I anticipate a change in format somewhere down the line. Right now I’m about halfway through the Sophie’s Tale chapter, and when that comes to a close decide what changes would be best for it. Probably doing away with the twice-weekly 4-panel strip in favor of page layouts and possibly a downloadable chapter at a time instead of regular updates. This is just me thinking out loud, though, so grain of salt and all that. Because that’s where my heart lies right now–not the salt, that would sting–in book-length projects or one-offs. I want to explore some new subject material (for me), and be free to pursue short term and longer term projects as they present themselves. I also have book projects I want to complete for Sips & Shots, so there’s that, too. I’m still here, I’m still drawing, but my goals–big, hairy, audacious or otherwise–and just shifting. I hope you’ll hang around and see what I’ve got up my sleeve! Posted in Gossip. Tagged BHAG, change, directions, goals, monster in the mail, plans, the word chef. This article first appeared in the August, 2012, issue of Self Publisher! Magazine. My first 3 years of tabling at comics conventions were grim. High hopes going in, stark reality waiting back at home. Low sales showing me that I just wasn’t reaching the right audience. Scant pageview increases after each show for my webcomics, but not much else. I knew my premise was sound and my skills, though still improving, were there, I just hadn’t found the right way to connect with potential readers. Luckily I’m persistent (read as: stubborn) and I had more than just the one idea up my sleeve. After taking a year and a half off from conventions I’m happy to report I’ve made my come-back, and finally figured a few things out in relation to coming home with more than questions after a convention. In its sixth year, this was the first year Ancient City Con filled out into a full 3-day convention. Since it was just a couple hours away, it seemed the perfect place to put What to Feed Your Raiding Party out in front of strangers and see if this dog would hunt. Not only did it hunt, it tracked, treed and brought the prize home! Unlike other conventions, where I stuffed my table with 2 books, 4 minis, merchandise and prints, all I sold at Ancient City Con was my newest work. I noticed, at previous conventions, that people would glance at my table and their eyes would glaze over and move on, quickly, to the next table. I think there was just too much going on that they didn’t know what to look at, so this time I streamlined the table and I think it helped. Not that I went ultra-modern with just the book on the table, that’s too far on the other side of the spectrum. 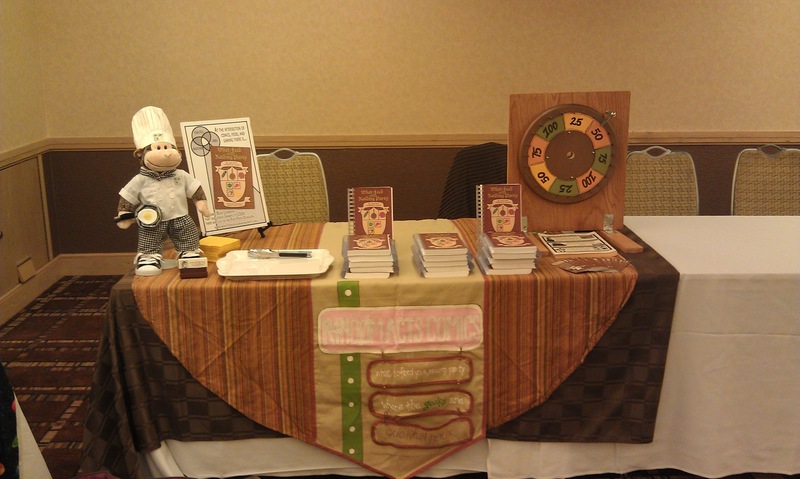 We kept varying heights on the table by placing the Wheel of XP on one end and an 11×17 sign on the other, along with our chef-monkey-mascot. The Wheel was also useful for keeping the cash box out of view and the sign for tucking away my tall glass of hot tea and messy art supplies. We put small stacks of books at the front of the table and some leaning on stands behind. Comparing past cons to present, because of the number of items for sale, I would keep only one of each book standing up and the rest in a rack behind. If there’s only one of something, most people aren’t going to disturb the display to flip through it. Having multiple copies around made them feel more accessible–I’ll bet that’s why bookstores do those big displays, huh? The Wheel of XP also generated interest. I mean, you’ve got a wooden wheel with values on it, who wouldn’t want to give it a whirl. We had plenty of folks walk up and ask “What’s that” or “Can I spin the wheel?” The fact that the Wheel was a glorified “gift with purchase” made it a great lead-in to start the sales spiel. Folks, I was selling a cookbook, it only made sense to give away samples from the book to get people to stop at our table. Instead of selling my book the moment they came into table range, it was like I was hosting a party at home and offering my guests something to eat. As someone who hates the hard sell and never wants to come off like a huckster, being able to offer something people were more likely to take and enjoy calmed my nerves considerably. Granted, plenty of people declined, but enough came up and accepted my offering, and a good portion of them took a moment (usually while they were chewing) to glance at the table, giving me an opening to say “If you like them, the recipe can be found right here…” By the end of the 3 days I had my pitch down pat (mostly) and some people were handing me their money before I’d even finished. While it’s true I consider the long-term effects of getting my name out there just as much as I do sales, it’s the numbers that are the best measure of whether a convention was successful or not. Because I’d made enough in pre-sales and first-month orders to cover the table fees and hotel, my break-even point was around 18 books to cover gas, meals, and the extra costs associated with the samples I made to share at the table. Not only did I meet my break-even point, I also made enough to start planning for conventions for later in the year. And just to put things into perspective, about ? of the way through Day 2 of the con, my helper monkey informed me that I’d officially outsold my first 3 years of conventions. Combined. But sales aren’t everything. We were lucky to be placed between writers and artists that were friendly, the staff was amazing, and the attendees were some of the best I’ve ever had the pleasure to meet. Again, it probably didn’t hurt that I was feeding anyone who stopped by, but there’s a reason southern hospitality is so renowned. Ancient City Con proved that I’d finally created something people were interested in and would happily buy (or trade for, in the case of fellow vendors). With patience, I have hopes that my webcomics will find their places, too. That’s when I’ll have to spring for the 10x10s so I’ve got enough room for everything! Jennifer “Scraps” Walker is the artist behind the webcomics Cocktail Hour and Where the Geeks Are. Her newest project, What to Feed Your Raiding Party, is the comic book cookbook that challenges gamers to cook their way out of the fast food dungeon. All of her current projects–blogs, cocktails, and comics–can be found via her online hub, www.jenniferwalkeronline.com. Posted in Gossip. Tagged ancient city con, conventions, lessons learned, post-con report, what to feed your raiding party. Posted in Gossip. Tagged Gossip, plans, schedules, self publisher magazine, updates. Safe to say Year 4 (it is year 4, isn’t it? or, rather, wasn’t it…) will be known as the Lost Year in Random Acts history. Not that I haven’t been a busy little monkey. And not that I haven’t been drawing, either! I’m about to finish up Chapter 4 (of 5, plus a prologue–done–and epilogue) of What to Feed Your Raiding Party. Well, the pencils. Which, let’s face it, is the long, laborious part of things. Inking goes quicker as long as my hands hold out and, yes, there’s still the formatting to do of the rapidly-approaching-200-pages tome and the spot illustrations and cover BUT the onerous penciling (and creating scenes and worlds from just my grey matter–definitely the most exhausting part of it all, really) is drawing (and I typed that with absolutely zero irony) to a close. Which means Cocktail Hour will return to tell the story of the house on Longview Drive. One upside to the delay? I know how a major part of that story ends, which was very much up in the air when we started. I’m looking forward to getting back to both Cocktail Hour as well as Where the Geeks Are (oh, yes, it’s still floating around there, too!) but I’m not even going to go down the rabbit hole of I’ll be back on such-and-such date. As much as a deadline has the power to motivate, I honestly have no idea if it’s going to be another 3 months before I can get back here or (dear god no) more. And I just don’t want to let either of us down. In the mean time, please make sure you’re subscribed to the RSS feed (would you like an email option, too? because I can do that if even 1 person would prefer it that way) to know when stuff starts to happen over here, again. And check out What to Feed Your Raiding Party, where I do a status update once a week. Even if it’s to say I’ve finished 1 page or a brainstorm, I post. Thanks for your patience, you’re the best! Wow… A year, already? So much has happened in the last 12 months and, yet, sometimes it feels like it’s only been a few weeks–not 52! A couple of art projects, a handful of other posts and 1 big house move. It’s been a busy year with it’s fair share of bumps but, wow, I’m really looking forward to 2011! Several of the blogs have been a smidge dormant the last couple of months (and, yes, I’m going to post this across the various blogs just to wrap up the year nicely) and that’s something I’ll be working on in the upcoming year. I don’t set resolutions, but I do make goals and I like to set intentions. Among the goals are finishing What to Feed Your Raiding Party and getting it into print. That’s a pretty big one, sure, but the work I put in this past year will make finishing it this year doable. I’m looking forward to wrapping up the remaining 15 state cocktails for Sips & Shots and starting the new series (ooh, secrets, but you’ll find out soon enough), as well as continuing on with the 64 Arts project–I’ve got some big plans for that one, too, but it’ll take more than a 2011 to accomplish those. Getting back to the 2 webcomics is also on the list, once the book is finished. Personally, my overriding intention is to find balance, happiness and fulfillment in the new year. Yes, it’s a bit of a vague intention but I think these sorts of things need to be: what seems fulfilling today, on the eve of a new calendar year, may be very different from the fulfillment I seek 3, 5 or 7 months from now. I wish you all well in the new year! And please know that this isn’t an easy decision for me, I’ve been fighting it for more than 2 months because I’m stubborn and didn’t want to admit I can’t do it all. Please hang with me through this–the best is yet to come! So, we’re back from our 2nd con of the year and I must say I think I prefer the smaller cons like MobiCon to the major media cons like MegaCon. The smaller the con, the smaller the dealer’s room, the more chances of repeat visitors, the more opportunity to have conversations with random con-goers and, yes, the more sales could happen. It wasn’t a stellar con, sales-wise, but I’m okay with what I did sell. I’m getting a better idea of what is going to work for Cons and what might not, and better ways to focus a table on them. Of course, the next con is DWEX so it’ll be a different crowd so, well, who knows? I didn’t do a lot of shopping this con but I did pick up a pair of earrings (from a girl whose card I neglected to get) and a Romanti-Goth coloring book from Seraphemera Books. I’m not goth of any kind, but I love the idea of an alphabetical goth coloring book–just need to stock up on some darker shades! I had a great table-neighbor in Professor Tesseract of Gryphon Arrow. It was great to see Aardvark Screenprinting again–they have awesome shirts and Waverly’s smiling face is always a happy sight! We also made a new friend: Miki of LaCourse Studios. She’s got great jewelry–those pictures hardly do her clay-work justice–and if you’re in her neck of the woods (North Carolina) she teaches classes, too! Finally, I had to great fortune to meet some of the folks from CoastCon! CoastCon 34 will be next March and I’m already making plans to be there and be a part of it. It just so happens that the fine folks from CoastCon (at least the one’s I met) also happen to be a part of Area 504 (warning: flash intro with music, if you have to skip it because you’re at work or something, use this link instead): a group that considers themselves a drinking club with a science fiction problem. How perfect is that? Sales may not have been astounding, but the people were awesome and that’s why it was a great con. Posted in Gossip. Tagged conventions. First, today is my birthday and if you can’t bend (your own) rules on your birthday, what’s the point? Find out the rest of the story over at Sips & Shots! Posted in Sips & Shots. For the Love of Fondant… or Not! I am not a big fan of fondant. Just thought I should get that out in the open right off the bat. It’s a pain to work with, leaves much to be desired on the taste front and it’s just not my preferred medium when it comes to cakes. Read some of the better points of and tips for working with fondant over at Nibbles ‘n Bites. Posted in Nibbles & Bites.